The Quadruple strength Omega-3 Fish Oil Pills have been rated as being the best quality on Amazon, and have been noted as offering four times the potency of fish oil supplements purchased in stores. The clinical strength of this product has been rated at 3000 mgs per dosage and have been given the 100% stamp of approval. 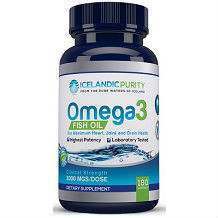 In addition, the Omega-3 Fish Oil pills are derived from Icelandic Purity Fish Oil. Gelatine, vegetable glycerine, food glaze, purified water and Vitamin E.
Other Omega-3 fatty acids – 300 mg. Viewing the supplement facts, the recommended dosage for the product is three softgels on a daily basis, or as per the recommendation of a healthcare professional. The warning for consumers is that should they be a diabetic or if they are taking blood thinners, their doctor should be consulted beforehand. 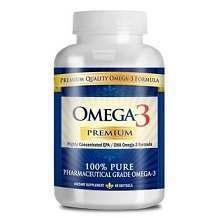 The listed price of the Quadruple strength Omega-3 Fish Oil Pills is $29.96. There is however, a special that offer consumers the chance to purchase 3 bottles of Omega-3 for the price of 2, should a code be entered at the checkout. As with other reputable vendors, Aventa Labs does offer a 90 day money back total satisfaction guarantee. However, the details of the money back guarantee is not clearly visible and as such, one is not able to learn more about the guarantee and what needs to be done, in the event that the buyer is not 100% satisfied with the product. Several customer reviews exist but as for the money back guarantee, little or no information is available. This product seems fairly good. However, it does not have the FDA seal of approval that would elevate its status.